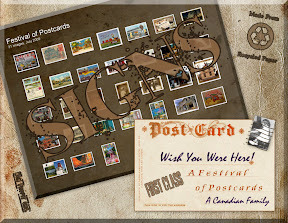 This blogpost was prepared as an entry for the 3rd edition of A Festival of Postcards which was hosted by Evelyn Yvonne Theriault. The theme for this edition was Signs, for which we were asked to, "Publish one or more postcards that show actual signs (e.g. road, advertising, storefronts) OR interpret the theme in whatever way you want (e.g. signs of the times)." My Mom has photos (from the early 1920s) of her mother, Elizabeth Marilla Henry nee Smith (1912-1932), enjoying outings at Old Orchard Beach, and Mom and I spent some time walking that beach ourselves, so I chose to use a postcard from my collection that relates to those family trips. 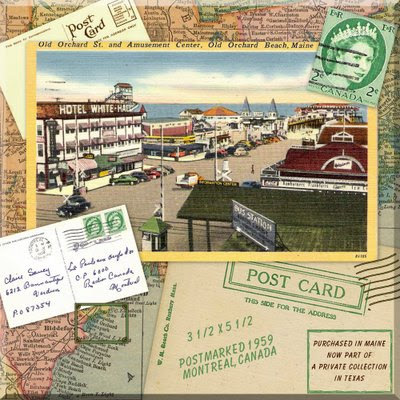 The postcard is captioned, Old Orchard St. and Amusement Center, Old Orchard Beach, Maine, and is featured in the following collage. It was purchased during a trip my Mom and I made to Maine, the home of Mom's maternal ancestors. It was printed by Tichnor Bros., Inc. of Boston, Massachusetts, and is postmarked 1959 from Montreal, Canada. The postage stamp in the upper right corner is one the stamps from the actual postcard. Among the SIGNS on the storefronts facing Old Orchard Street in this image are . . . Hotel White-Hall . . . Bus Station / Boston & Maine . . . a diner advertising Coca Cola & Hamburgers & Frankfurts & Ice Cream . . . and in the far right background is visible the Casino sitting out over the water at the end of the Pier. John Greenleaf Whittier said that, "They seek for happier shores in vain, who leave the summer isles of Maine." While Old Orchard Beach is not one of the many "isles" of Maine's Casco Bay, it has long been considered an isle of escape for more than two century's worth of vacationers. It is said that many Canadians come down for summer vacations, and that it is common to hear conversations in French. Old Orchard Beach has been promoted as a tourist destination since 1631, when its first settler established a Garden By the Sea. In 1829 the first Public House opened, and in 1837 tourists paid $1.50 each to stay at a local farm. Railroad service between Boston and Portland opened in 1842. Over the years Old Orchard developed into a major resort. Airplanes took off from the beach and auto races were held on the sand. Most of the large hotels were destroyed in the fire of 1907. From Old Orchard Beach by Daniel E. Blaney . . .
From 1631 to the present, Old Orchard Beach has had a singularly rich history among New England's summer communities. Old Orchard was originally a small seacoast farming community nestled on the shore of Saco Bay. When the railroad came in 1873, the coast exploded into one of the grandest Victorian settings in Maine. It boasted famour religious camp meetings, transatlantic flights, big bands, big fires, harness racing, and automobile racing on the beach. The Kennedy family, Bette Davis, Fred Allen, Rosa and Carmen Ponsell, Pierre Trudeau, and Charles Lindbergh all rejuvenated themselves in this community. Old Orchard Beach is still a vacation mecca, and residents and visitors alike will find enjoyment and education within these pages. . . . The pier was built in 1898. On March 17 of that year, actual construction commenced. The original twin pavilion was short-lived. The grand opening was on July 2. On December 4, the end of the pier was swept away during a northeast gale, only 156 days after opening. The ballroom, at the end, featured every well-known East Coast band. The big band era ended in the 1960s with the advent of rock and roll and record hops. Louis Armstrong was among the last big bands to play on the pier. . . . I think you may have talked me into a Maine vacation some summer soon. Great post. Boy those postcards of Old Orchard Beach sure bring back memories! I first went there with my mother and grandmother when I was a young girl. I know I've mentioned this before, but I'm going to say it once more. Your digital artwork is beautiful! Thank you so much for sharing it. 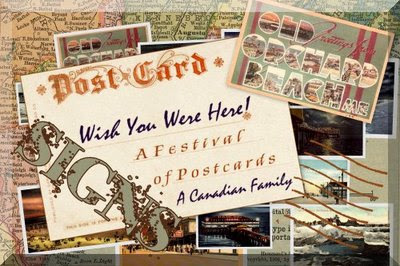 Great digital contribution to the festival of post cards, really like the thought process that it takes to include lots of little details to make your creation special. Many of the Festival readers have never tried digital scrapbooking before - or even heard of it. How do you get started? Do you do it with a special software program? I love the way you have treated the presentation of this card. I may pinch a few ideas from you, for arranging my family photos and documents. Terry, glad you enjoyed your visit. lindalee, I'm ready for Maine again -- just can't decide on the season (L-U-V the autumn in Maine). Lucie, my 1st trip to Old Orchard was the autumn of 1977 -- I fell in love. Caroline, thanks dear! Pearl Maple, so glad you stopped by and took a look. Luv your work! Sheila, glad you like the process -- I would love to see what you come up with. And finally, Evelyn, thank you, my dear, for inspiring us via your "Festival of Postcards." 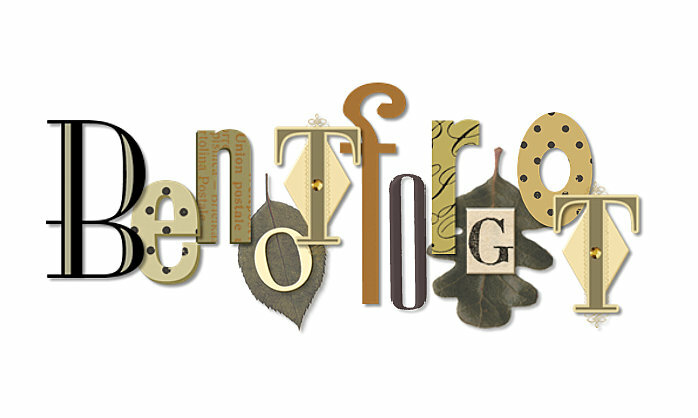 I use Picasa for my digital creations -- it's what I had, & I just started playing around with it. I've been pleased with what I'm able to do with this free program from Google. It allows quite a bit of room for creative experimentation. I added a little token of appreciation to the above blogpost for you. Thanks for what you do for postcards! Vickie E.